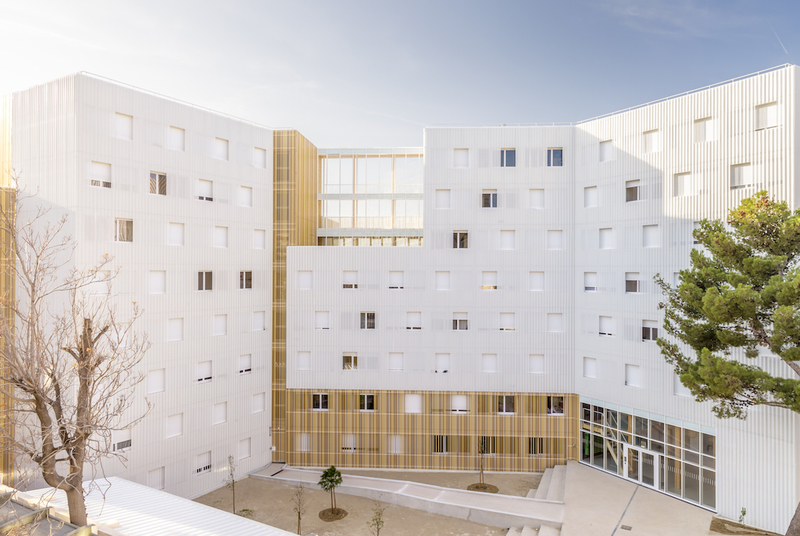 In Marseilles, A+Architecture has designed one of the highest wooden buildings in France for the CROUS: the Lucien Cornil hall of residence. 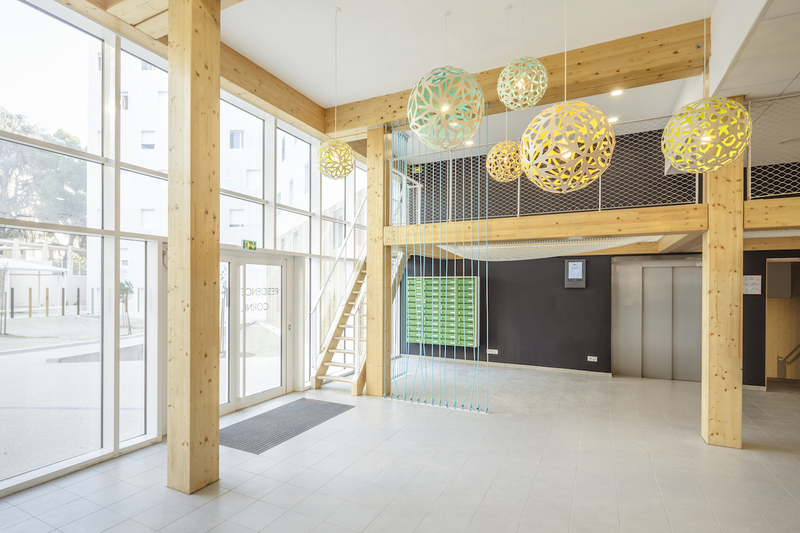 This eight-floor student residence is the fruit of a successful environmental and construction period. 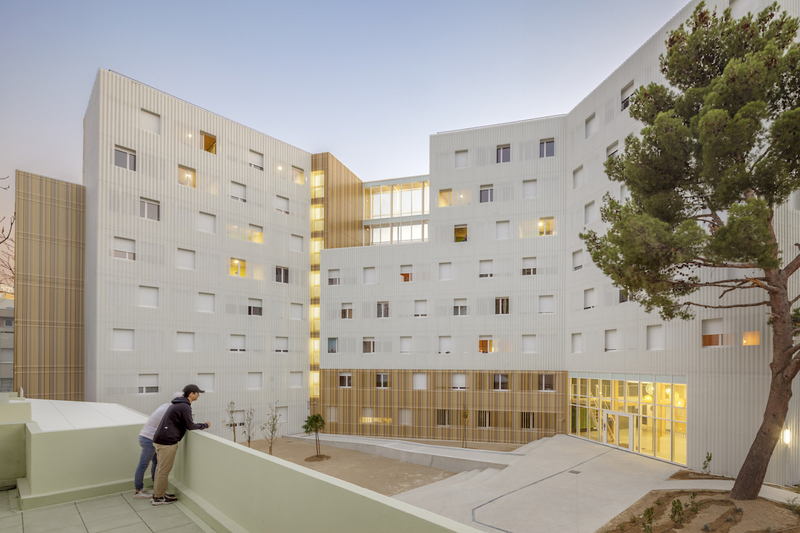 Its sensitive urban approach makes this 200-room structure a functional building, comfortable and opening out towards the city. 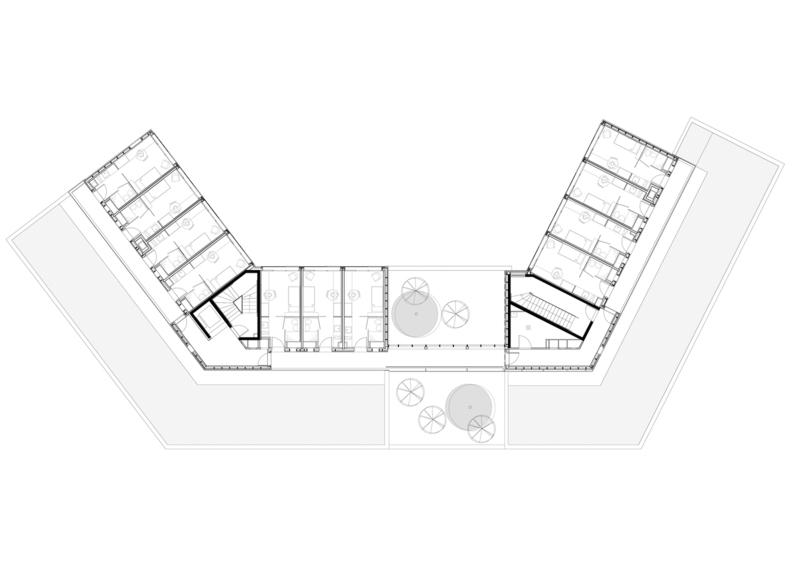 Consisting of three wings, the design benefits from a very high ground floor and attics on the top two levels as well as quality shared spaces. 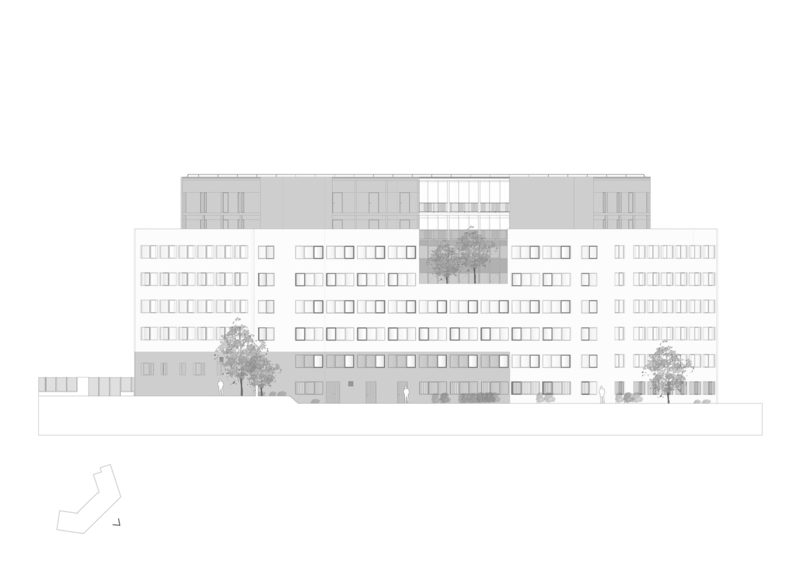 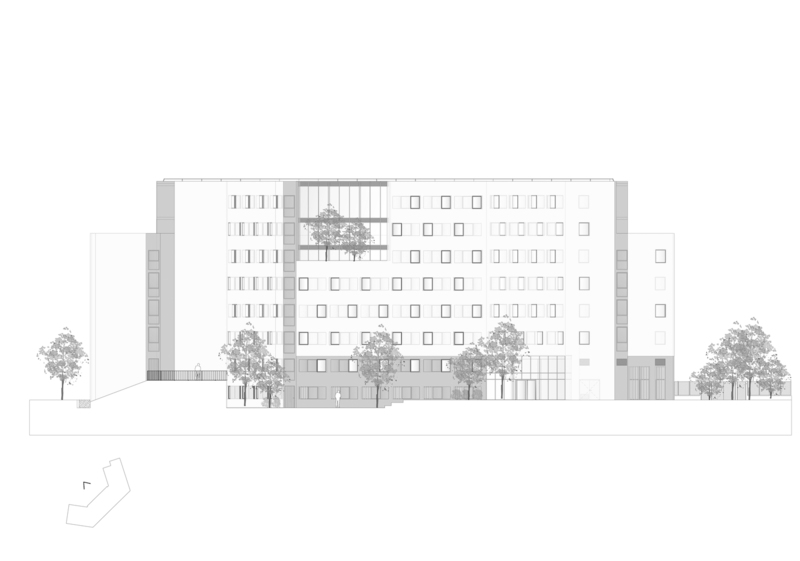 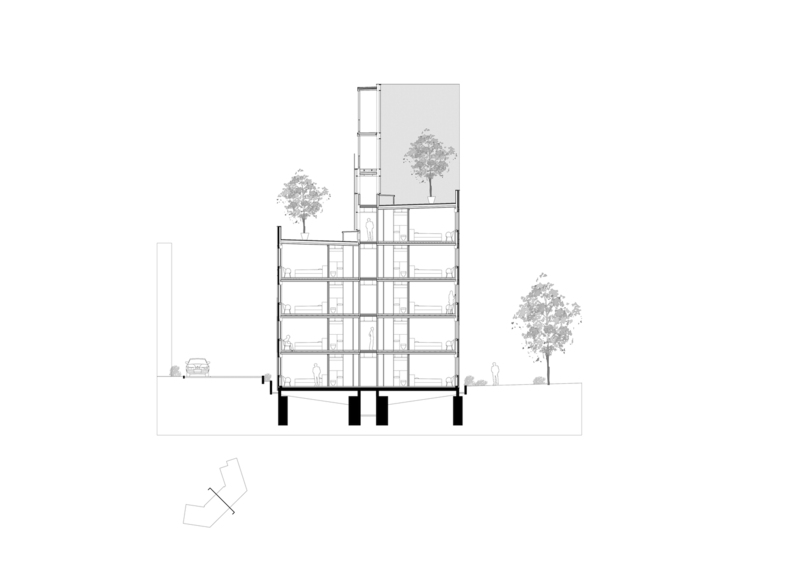 The graduation of the building heights of the project will interact with the surrounding buildings and leave them with space to breath despite the density of the area. 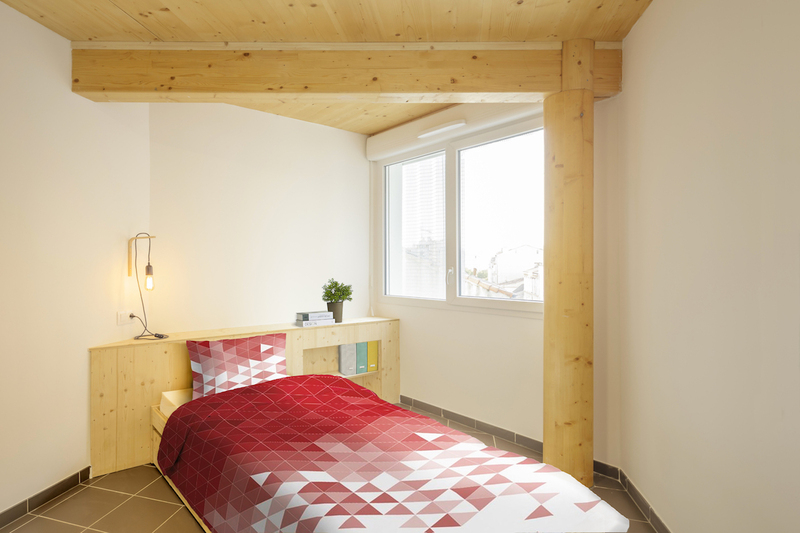 Most of the rooms are directed towards the enclosed garden, a genuinely relaxing indoor garden, on the street side, the openings are positioned along the less noisy alley. 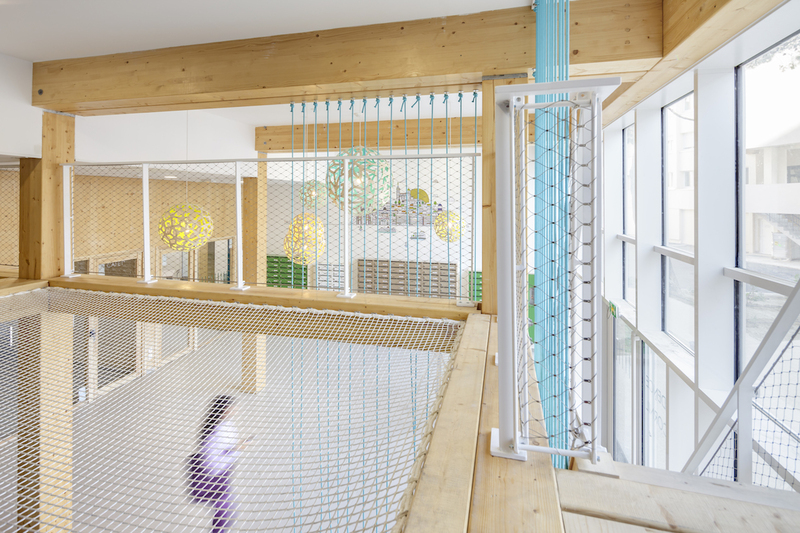 In this constricted urban environment, the choice of wood construction (excluding vertical knots) was obvious. 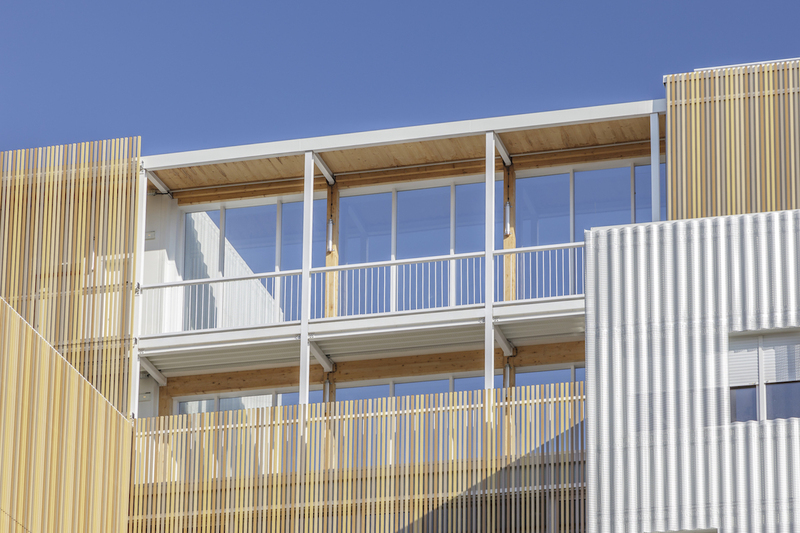 Reduction in disruption caused by the works, an optimised schedule, but also a commitment to the comfort of the residence are what convinced the CROUS to embark on the adventure. 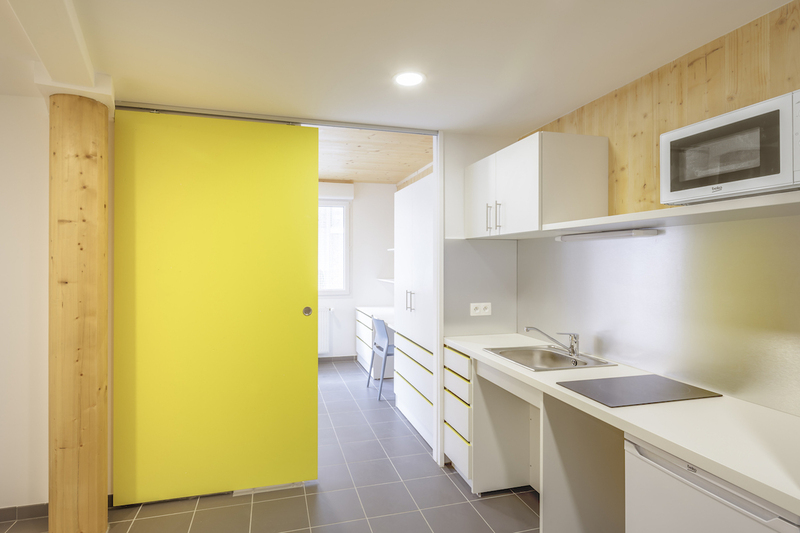 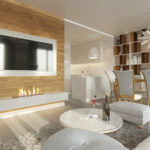 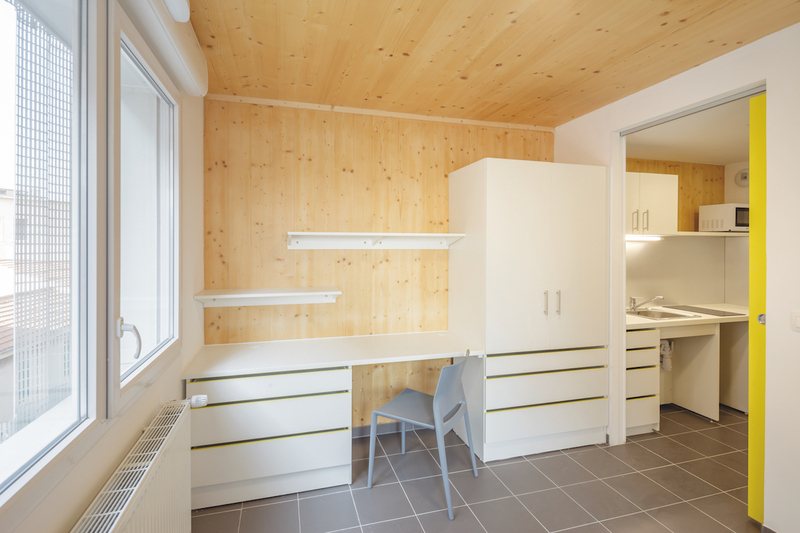 The use of solid wood CLT (Cross Laminated Timber) limits energy consumption and provides an excellent carbon footprint. 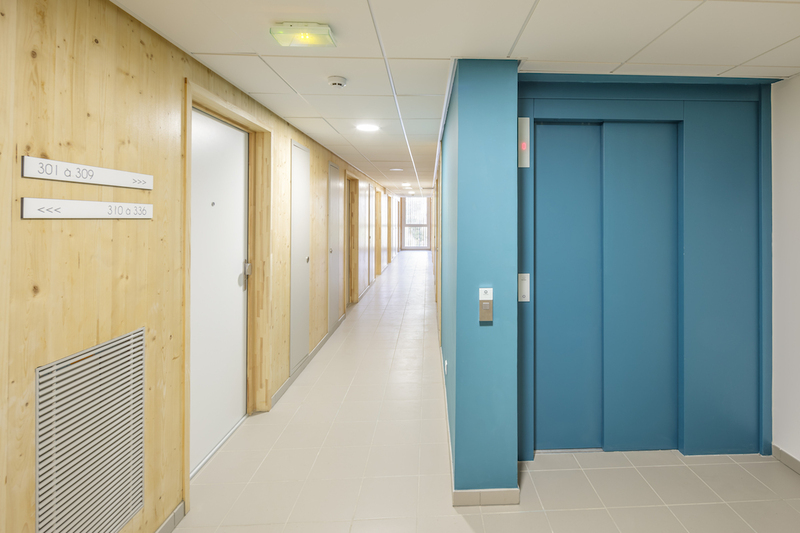 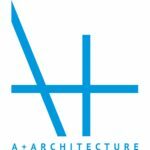 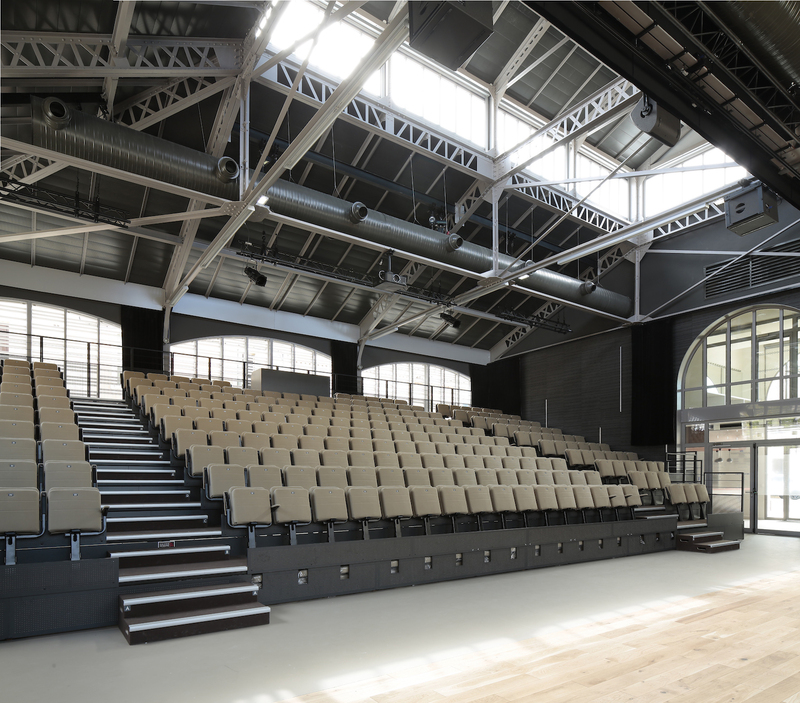 “The entire building has been designed to be very heat and acoustically efficient, while maintaining consistent lines and at a very competitive price”, states A+Architecture. 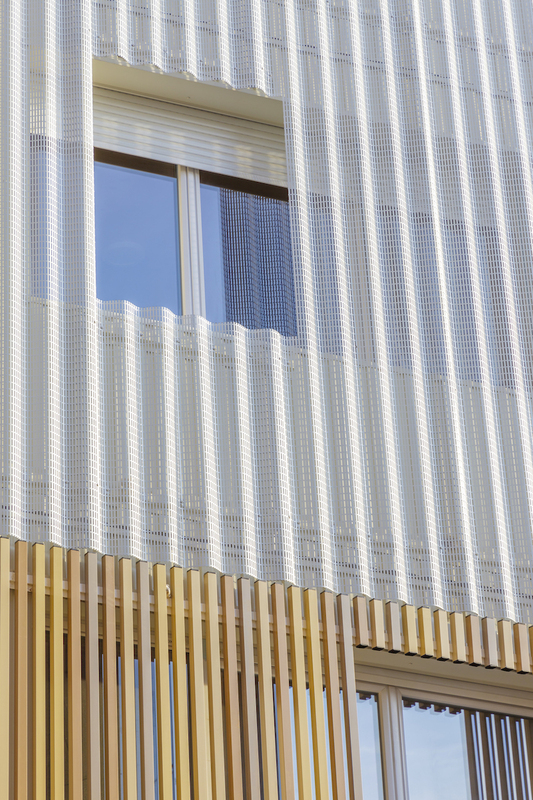 The cladding is something else. 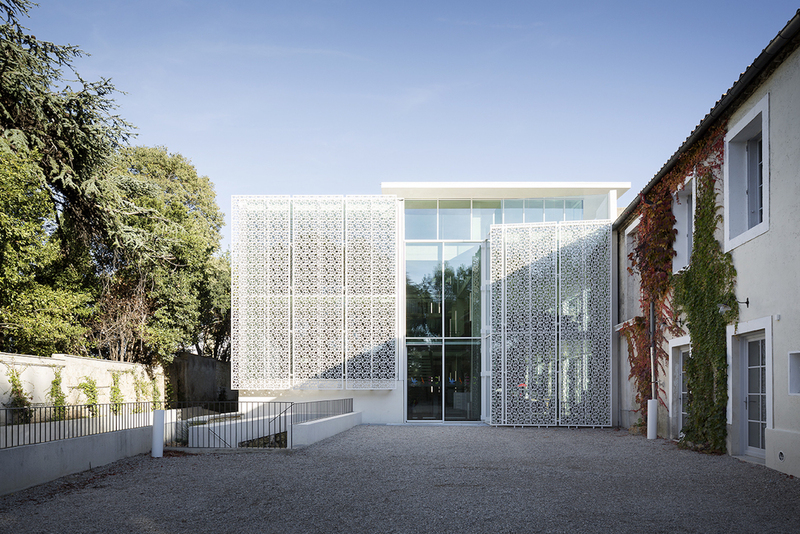 A perforated curved panel is mixed with large aluminium shingles to mix up the lines, reduce the scale and break-down the volumes. 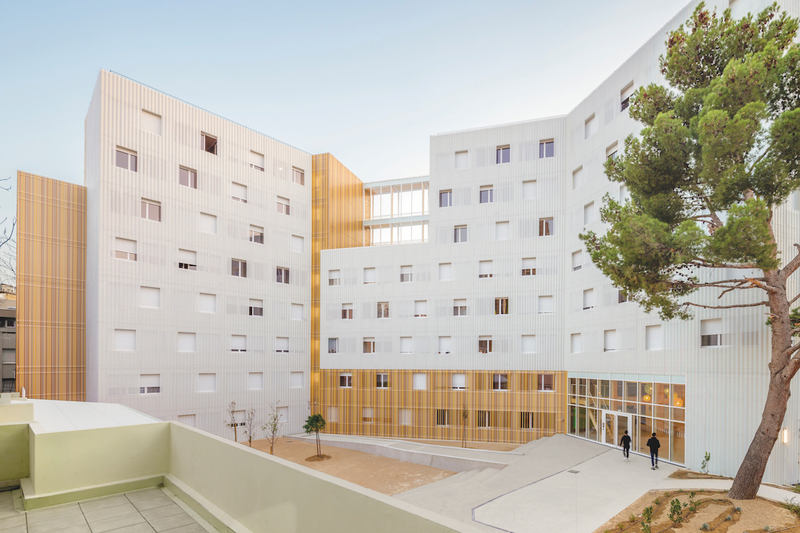 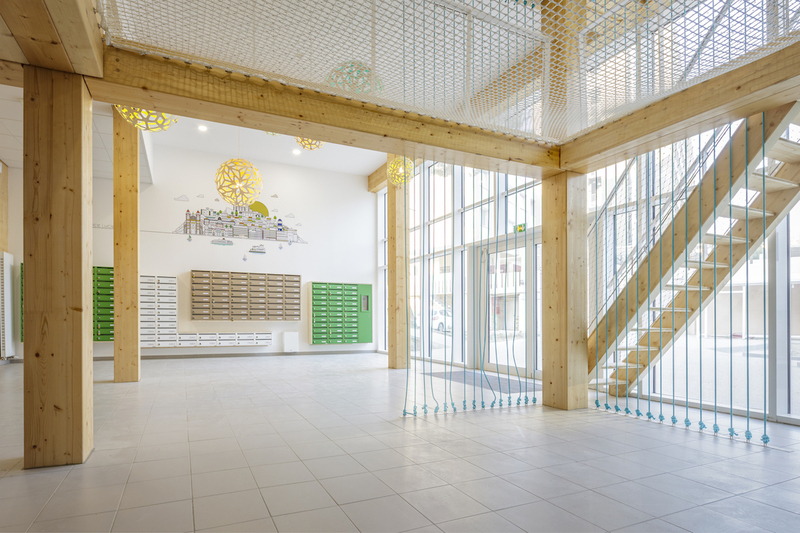 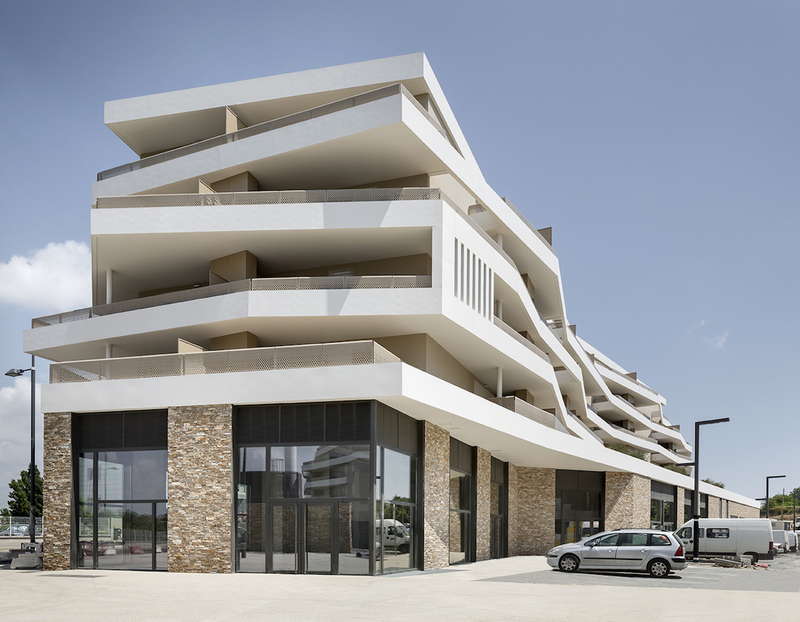 The perforated skin passes in front of a section of wide glazed strips, transforming the building in the evening to a beacon of light in the Marseillaise night. 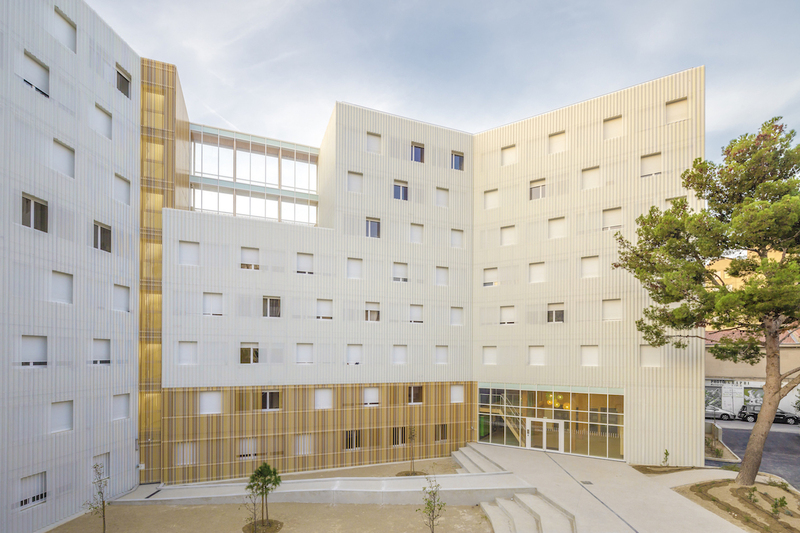 The landscaped interior garden, mainly pointing towards the city, is given over to meetings, the large piazza connecting with the rue Saint Pierre entrance highlights the carefully preserved majestic pine tree. 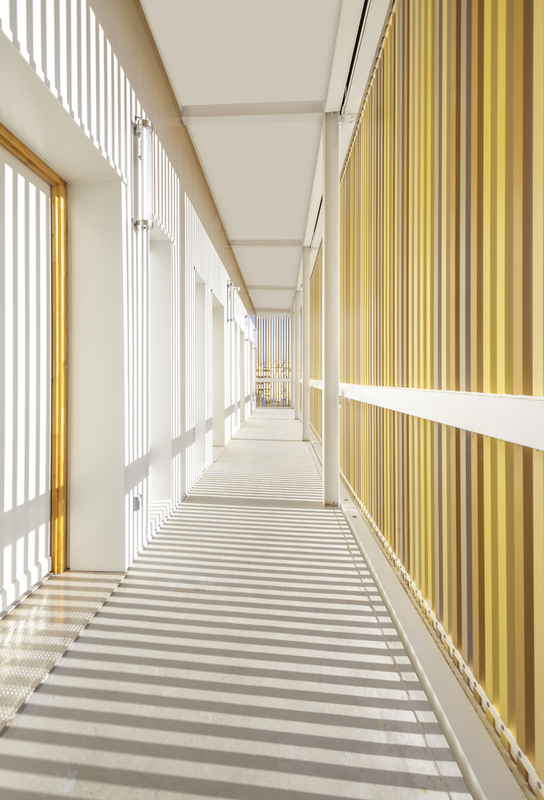 The light is magnified everywhere, sometimes filtered behind the perforations of the cladding’s protective cladding sheets or behind the aluminium railings in the upper sections of the communal areas, somewhat generous for the rooms, the blanking is provided by a roller shutter which closes off the entire opening. 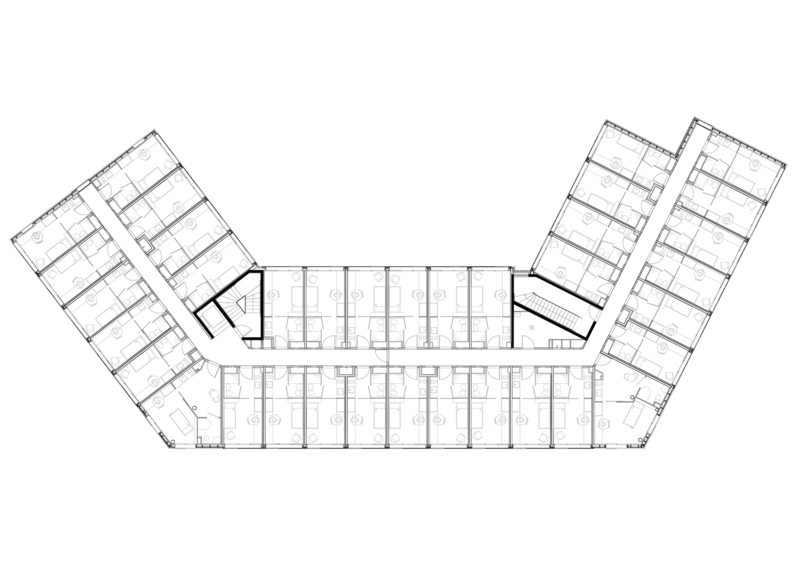 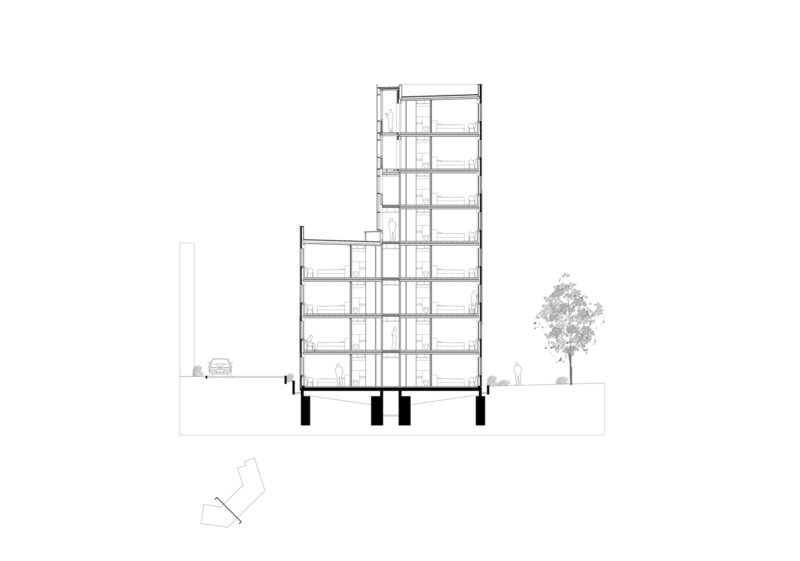 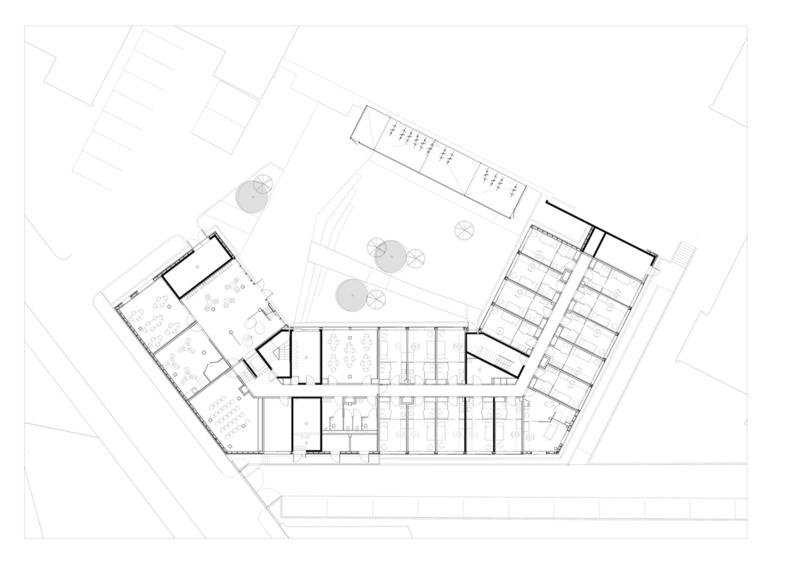 In a dense area, the location and choice of space occupied have enabled the communal areas, the circulation areas and the views to provide a functional building that opens up onto the city. 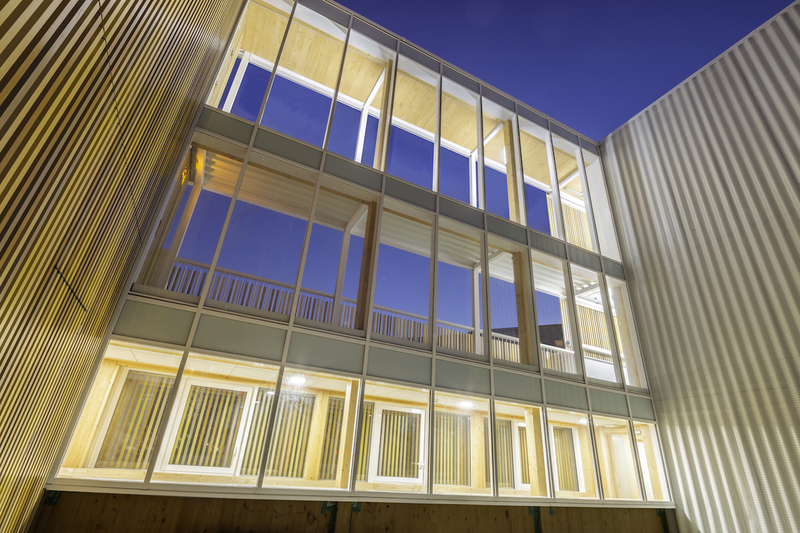 The wooden structure combined with a sensitive and functional architecture provides a solution very much of its time; innovative and in-tune with the environment. 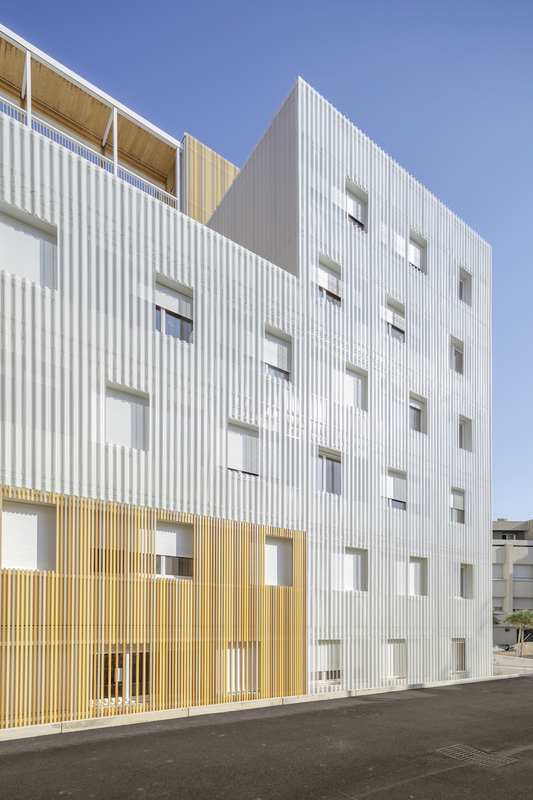 Lucien Cornil student residence, an eight-floors building with wooden structure in Marseilles designed by A+ Architecture.